India bounced back from an 80-run hammering in game one to level the three-match T20 series in New Zealand with a comprehensive victory of their own at Eden Park. New Zealand hammered 219 in that opening game but were restricted by disciplined Indian bowling to just 158/8 here despite a rollicking 28-ball half-century from Colin de Grandhomme that featured four sixes. But New Zealand managed to clear the ropes only six times in total and always looked well short of par. Seifert, man of the match in the first game, made just 12 this time before being caught behind off Bhuvneshwar Kumar, while Colin Munro also made just 12. The night’s most controversial moment came with the lbw dismissal of Daryl Mitchell, a decision upheld on review despite what looked a clear inside edge. That was the second of three wickets for Krunal Pandya that reduced New Zealand to 55/4 and firmly on the back foot. 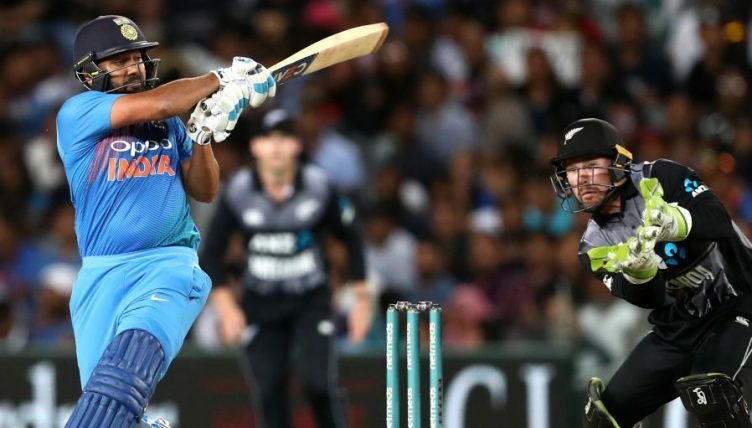 India captain Rohit Sharma broke the back of the run-chase with 50 from 29 balls including three fours and four sixes before the master MS Dhoni (20*) and apprentice Rishabh Pant (40*) eased India to their target with seven wickets and seven balls to spare. The teams now head to Hamilton for Sunday’s decider.